China's State-owned pension fund is likely to invest up to 20 billion yuan in the Agricultural Bank of China (ABC), a source close to the matter told China Daily yesterday. This will be ABC's first strategic investor before its planned initial public offering next year. "The investment has got the regulator's nod, and the fund has already started due diligence on the bank," said the source, who declined to be named due to the sensitive nature of the matter. The National Social Security Fund, which will see the value of its assets breach 1 trillion yuan in 2010, spent 28 billion yuan to buy into the Industrial and Commercial Bank of China (ICBC) and Bank of China (BOC) ahead of their IPOs in 2006. The two major State-run lenders are now 4.2 percent and 3.3 percent owned by the pension fund respectively. Besides the pension fund investment, the country's third-largest lender has also resumed its once-suspended talks with potential foreign strategic investors, including Credit Agricole SA and Bank of Montreal, the source said. The move marks a shift in the bank's earlier stance toward foreign strategic investors, but still reflects its wariness and hesitation in bringing foreign partners on board as strategic investors. Last month, the bank officially denied it had agreed to invite Canada's Bank of Montreal for share participation. "The financial crisis dealt a heavy blow to many Western financial institutions, which leaves little room for the bank to choose from," Fu Lichun, a banking analyst at Southwest Securities, said. Xiang Junbo, chairman of the ABC, said in an earlier interview that many foreign financial institutions had expressed keen interest to partner with the bank, but that the lender was wary about the prospects of introducing foreign strategic investors. The remarks were made after many foreign banks, including Bank of America, Royal Bank of Scotland and UBS, quickly sold or reduced their stakes in domestic lenders this year in an effort to repair their balance sheets strained by the financial crisis. This may have tarnished the foreign strategic investors' image and caused suspicions about the returns-driven nature of such investment. Ahead of the IPO of major State-run lenders ICBC, BOC and China Construction Bank in 2005 and 2006, these Chinese banks sold their stakes to a barrage of foreign banks, expecting to gain cutting edge expertise from the strategic partnerships with their foreign peers. 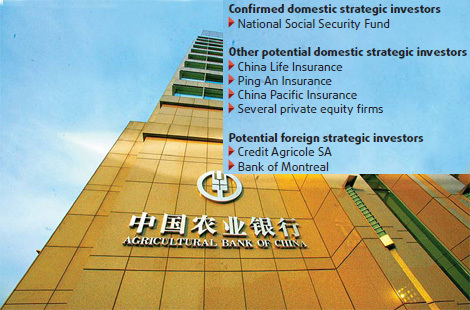 On the domestic front, the bank was also in talks with prospective investors from within the country, with China Life Insurance, Ping An Insurance, China Pacific Insurance and a number of domestic private equity firms topping the investment list, the source said. The lender, which specializes in serving the nation's 800 million farmers, has been restructured along commercial lines to prepare for a stock market listing. After wiping out 800 billion yuan in bad assets and receiving $19 billion in capital from Central Huijin, an investment arm of the nation's sovereign wealth fund, the bank's core capital adequacy ratio and capital adequacy ratio were boosted to 8 percent and 9.4 percent, respectively, as of the end of 2008. The bank reported a net profit growth of 13 percent in the first nine months this year, while its bad loan ratio has reduced to 2.65 percent as of the end of September against the industry average of 1.66 percent.